Kolbers, I ran into a significant problem on my Firestar, and it may cause me to not be able to finish the project. I hope this is not as much of a problem as I fear. When I bought my HKS engine I did not know to ask whether it had one type gearbox or another. It has the 3.47 to 1 box, which will spin a large propeller very slowly. After reading some ot the Kolb List stories about high thrust lines and putting the Kolb over on its nose, I realized I wanted to keep the thrust line as low as possible for best performance and handling. However, with the gearbox rotated to the "down" position, it limited the propeller diameter to 64 inches with a one inch tailboom clearance. With the 3.47 gearbox I have, a three blade propeller with 62-64 inch diameter is not enough... the engine will overspeed before I get the full amount of thrust. Someone suggested using a four or five blade propeller, but that would prevent the wings from folding back. I contacted the engine distributor to ask if I could switch the gears around to make my gearbox a 2.58 to 1 ratio,a nd you cannot do that without changing the gearbox itself. So I asked how much it would cost to buy a new gearbox, andit is way too high for me to consider doing right now. Maybe when I win the lottery. Someone else suggested that I turn the gearbox around facing "up", which would allow a much larger propeller. My first reaction was "Oh goodness no, that will raise the thrust line too high, and it will cause the airplane to nose over on takeoff, I'll run out of elevator control, etc. etc...."
But then I realized that was an assumption rather than a known fact. Before I gave up on the project, perhaps I can move the gearbox upwards and not have problems... but how far? So I would like to ask the experienced Kolbers: JUST EXACTLY HOW HIGH can the thrust line be on a Kolb Firestar 2 before it creates safety/handling/nose-over problems? Can the center of the propeller be 34 inches above the tailboom...36 inches...38 inches...40 inches???? Larry C's Warp is a two blade. I'm swinging a 66 inch Warp with the gear box in the down position. With the 3.47 to 1 gearbox???? I have run 72" props on my mkIII with 3/4" tail boom clearance. That puts the center of thrust 36.375" above the top of the tail boom. If the engine overpowers the elevator, come back on the power a bit. Doesn't take much to get a Kolb off the ground. Soon as you get some airspeed, go back to full throttle. I had to do that initially, when I upgraded from an 80 to a 100 hp 912. Kolbers that let the Kolb nose over on takeoff need to learn how to fly the airplane. I don't dump the throttle on takeoff. Be gentle and it will do what you want it too. Go to longer main gear legs to put the nose up and put more weight on the tail wheel. These are things I have done over the years with my Kolbs. Not recommending anyone else follow suit. THANK YOU John H, I appreciate the experience you have shared. I am also looking at photos and videos of Firestars and MK 3's, noticing how far above the wing the thrust line is. I even watched the 20 year old Kolb promotional ideo with a young John H flying the Slingshot It APPEARS from those videos that my thrust line with the gearbox turned "up" should fall within those dimensions. Anyone need an A-65 engine or a nice Avid Flyer B model airframe? thrust 36.375" above the top of the tail boom. when I upgraded from an 80 to a 100 hp 912.
what you want it too. nose up and put more weight on the tail wheel. With the propeller shaft in the SAME "down" position, the 3.47 gearbox I have will make the propeller turn at 1671 RPM at theax. coninuous power of 5800 engine RPM. At "cruise" RPM it will turn even slower. With the 2.58 gearbox that I suspect you have, your propeller will turn almost 2250 at 5800 engine RPM. So with those numbers, in order to get the same thrust (and absorb the same 60 horsepower and torque from the HKS) I would need a whole lot more propeller blade area than you would need. Usually you can just put on a 4 blade prop or 5 blade, and that will do the trick. But with a Kolb you can't do it and still fold the wings. Putting on a much wider chord propeller blade (a paddle prop that looks like a T-28 warbird) could work, but again in this case the prop blades would hit the rear of the wing when folded. So before I do anything rash, I want to figure out whether the "up" position of the gearbox is a minor problem or a huge problem. I know that "down" is the preference, but that cannot happen because I have the wrong gearbox. I will be HAPPY to call Warp Drive and ask them, he may have some magic wand that the other prop manufacturers don't have. it, please remove my email address before sending. With the 3.47 gearbox I have, a three blade propeller with 62-64 inch diameter is not enough... the engine will overspeed before I get the full amount of thrust. MY FS II is equipped with R503 DCDI, a C Box 3.47 - 1, mounted in the "Up" position and swinging a 68", 3 blade Powerfin 'F' model prop. In a couple of hundred hours, have encountered none of the problems you identified as potential ones. Don't bother wasting your time calling Darryl. He'll tell you that the gearbox won't work, blah, blah, blah. Horse exhaust. He told me that the 4 to 1 gearbox I run with a 582 was all wrong. Funny thing though, when I had a 582 in the shop with a 2.57 gearbox I started swapping props between the two. I had to put about 20 minutes (yeah, 1/3 of a degree) more pitch on the 4 to 1 engine. Otherwise, performance was the same. For what it's worth, the R3350's of the B29 turned the prop at a bit over 900 rpm.Suggest you leave the gearbox in the up position and put the short side up on the front engine mount and put the rear mounts long side up. Don't know if it will transfer from the Mk III but the lower prop rpm allows me to run a rudder trim tab that's about 1/3 the size of the factory recommended tab and the total deflection angle is only about 5 degrees. I need a tiny amount of right rudder on takeoff and a bit of left rudder in cruise. As for running a four or five blade prop, I have run a three blade Warp and a four blade Power Fin on my HKS. No difference when set right. I even stripped the Power Fin back to two blades. It vibrated a bit more and made virtually no difference so I put the other two blades back in. If you think your thrust line is high, look at the pics. Travis told me the factory set this engine up for the fourth owner of the PFH (plane from hell) who just had to have an "E" gearbox. 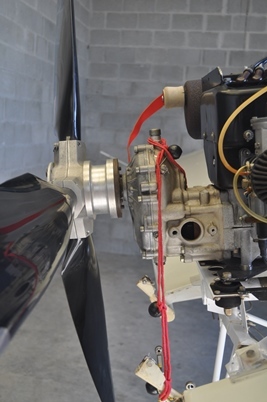 Your HKS will power your Firestar just fine, your prop will work just fine. I set my HKS so that the prop tops out at 6000 rpm on climb out. PS, the other benefit of lower prop rpm is that your airplane will be a whole lot more quiet. My neighbors told me they could hear the 2.57 gearbox engine all the way around the pattern, but the 4.00 gearbox was below hearing level when the plane was on downwind. Bill; notice the extent to which Rick raised his engine. (Great pictures) Maybe you can leave the gearbox down and raise the engine up? Everybody THANK YOU for taking time for this discussion. 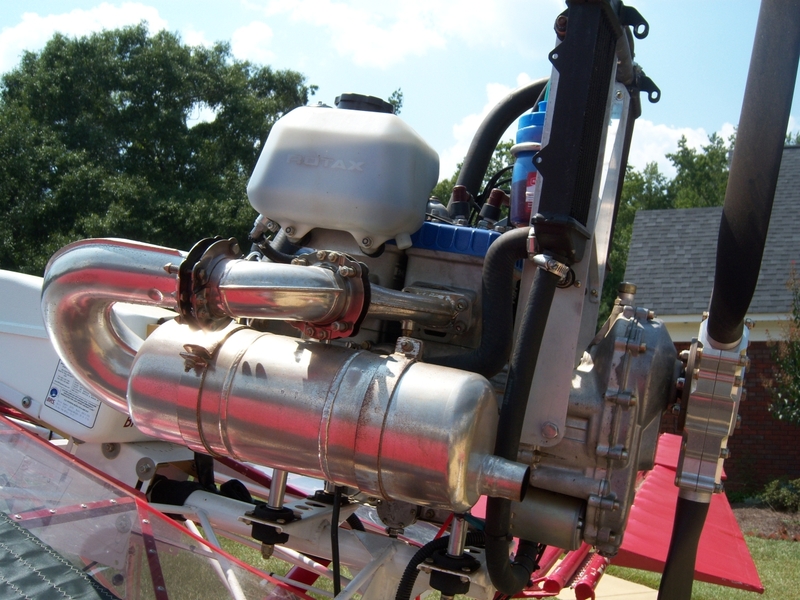 I spoke to the Kolb factory today by phone, and went out to the local UL flying field to see an HKS engine run. Duane and Bryan at Kolb were asked one specific question by me: What is the maximum number of inches allowable or advisable between the center of the propeller and the top of the tailboom? Bryan said that 36 inches is about standard for a "normal" Firestar, and he would not want to fly an airplane with that distance raised to 39 or 40 inches. I went back to my hangar and measured, and the distance on my Firestar would be over 40 or 41 inches if I turned the gearbox upward. So if the Kolb factory owner says 40 inches is too high, I can only be humble and assume that I wouldn't want to fly it at 40 inches either. If any of the highly experienced Kolbers on this forum are flying with their thrust line 40 inches above the tailboom, I REALLY would like to know about it pronto. As big of an ego as I have had a few times in my life, and as much as I think of myself as a reasonably skilled pilot, I don't need to be a test pilot here and try to push any envelope at this early stage. So if I can ask the Kolb ilst a favor... if any of you are flying a Firestar with the engine thrust line 39 or 40 or 41 incvhes above the tailboom please post this on the list and let me know ifyou have any issues with the handling, pitch-over, etc. gearbox down and raise the engine up? I am certainly not an aeronautical engineer by any means, but I realize that the higher the thrust line the more power it takes to fly. That long arm/lever is doing a good job of pushing the nose down, the elevators are working hard to keep the nose up, and that all takes power. Eventually the high thrust line would probably consume the aircraft. I mentioned a day or so ago a major difference from flying my mkIII with an 80 hp and then making my first takeoff with the 100 hp. It wouldn't break ground until I came back on the power. In a short time muscle memory took care of that little problem, but it was a good demonstration to me how much a high thrust line consumes power. Some things work and some don't. Well Bill, thanks for bringing up the topic. I replaced my little Rotax 377 with new low rpm Hirth 2702 over the winter. I really hadn’t measured the distance between the prop hub and boom tube. You sparked my interest so I stopped by my hanger this morning to check it out. The Hirth uses a G50 gearbox with 2:29 to 1 ratio. which translates to 2400 rpm prop speed (at) the engine’s max. HP rpm of 5500rpm. Anyway, it measures 35.5 inches. This is on a Kolb original Firestar. I did have to move the engine forward 2.625” to compensate for the extra weight of the new gear box. I went with a 64” 3 blade Powerfin prop set at 6.4 degrees of pitch. This setup gives me 3.5” of clearance from the boom tube. Thanks for inspiring me to check it out. I’m sure there is a good combination of prop out there for an HKS. 3.5" is about 2.5" to much. 1" clearance operating with stand Lord Mounts is more than adequate clearance. I flew with a 72" prop and .75" clearance for many hours, including my last 48 day flight to Alaska and back. Prop might be noisier with the tips passing that close to the tail boom, but I'll take the lower thrust line over noise. I'm flying with a 68" prop that gives me 2.75" of clearance. Can't tell the difference in noise level. It is still noisy. I have been pulling out what's left of my hair over this issue. I really don't want to quit, I LIKE the Kolb airframe and it will fit my mission well. I like the HKS fuel economy and improved reliability. I just wound up with the wrong gearbox on it and cannot afford to change it. 1) My 3.47 to 1 gearbox really wants to swing a larger propeller than what is actually "correct" for the height of the thrust line on the Kolb airframe. 2) Turning the gearbox upwards will solve the prop diameter problem, but it creates a thrust line that is higher than the Kolb factory thinks is advisable. 3) I could easily go to a 4 or 5 blade propeller, solves the gearbox AND thrust line problems, but that interferes with folding the wings. 1) Get a 5 blade propeller and remove it after every flight, which would allow ALL of the problems to be solved, at the cost of additional time and effort every time I fly. This will cost the least of all the "solutions". 2) Remove the wings after every flight instead of folding the wings. This allows a 5 blade propeller to be used but adds complexity and requires me to build a complicated ground fixture to allow the wings to be removed and installed by myself alone. 3) Make a folding propeller, like the electric R/C model gliders have, where the blades fold rearward. This solves all of the problems, no complex ground equipment, but designing and manufacturing such a propeller will be prohibitvely expensive. 4) Buy another gearbox from HKS. This is the best solution mechanically, but I cannot afford it. 5) Turn the gearbox upwards, install the right propeller, and live with the possibly dangerous or funky flight handling of the airplane. Any other/better/wiser/workable ideas from the Kolb List are very very welcome! out. 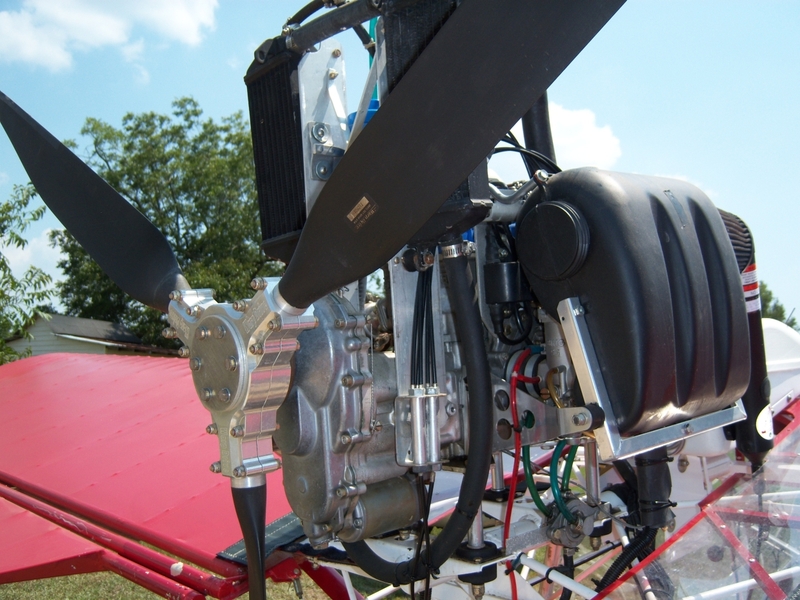 The Hirth uses a G50 gearbox with 2:29 to 1 ratio. max. HP rpm of 5500rpm. of prop out there for an HKS. of the propeller and the top of the tailboom? the tailboom, I REALLY would like to know about it pronto. pilot here and try to push any envelope at this early stage. > via the Web Forums! Bill, I know that this might sound crazy but, can’t you just buy a different set of gears for the gearbox? Being a mechanic may be a benefit here but I can’t imagine that HKS can’t supply replacement parts. The gearbox case doesn’t care what gears fit inside of it. If they don’t, I’d sure shy away from buying one. The replacement gear set does not fit into the same gearbox case. So unfortunately I cannot just buy two new gears and slide them into place. BUT... I am making progress towards one of the other potential solutions. After consulting with an experienced aircraft structures and metallurgy engineer, I believe I can make a simple prop extension that is held on with one central nut (a great big nut !) and remove the propeller before folding the wings. The key to doing this SAFELY is called the Belleville Spring, or Belleville Washer. It is a conical spring steel washer that becomes flat (like a regular washer) as it is tightened, providing a known, reliable tension/compression force over a reasonable range of installation torques. This means that I can install the propeller, tighten the nut until the Belleville Washer is more or less flat, and be confident that there is plenty of tension/compression in the propeller mounting without having to use a torque wrench, elaborate bolt stretch charts, etc. etc. This also provides a much more convenient and error-proof option instead of havign to torque six propeller bolts and safety wire the bolts, install six Cotter Pins, etc. All of this means I will be hopefully able to use a 4, 5, or 6 blade prop with the thrust line within Kolb's recommended distance from the tailboom. The HKS engine is a VERY good quality engine and I believe the other Kolb/HKS owners will agree they love the engine. If you wish to use this engine on a Kolb, don't hold my mis-adventures against the engine... just make darn sure you get the 2.58 gearbox ! can’t imagine that HKS can’t supply replacement parts. The gearbox case doesn’t care what gears fit inside of it. well. I like the HKS fuel economy and improved reliability. problems, but that interferes with folding the wings. removed and installed by myself alone. > 4) Buy another gearbox from HKS. dangerous or funky flight handling of the airplane. ideas from the Kolb List are very very welcome! with 2:29 to 1 ratio. > max. HP rpm of 5500rpm. > Anyway, it measures 35.5 inches. > prop set at 6.4 degrees of pitch. > of clearance from the boom tube. > of prop out there for an HKS. > time for this discussion. > an HKS engine run. to know about it pronto. envelope at this early stage. >> via the Web Forums! If you are worried about the effects of a high thrust line, you may want to consider adding some area to your horizontal stabilizer. This should reduce some of the increased stick forces and tail work load.